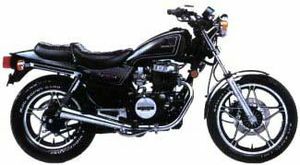 The Honda CB450SC is a motorcycle made by Honda starting in 1982. It is commonly known as the Nighthawk 450. 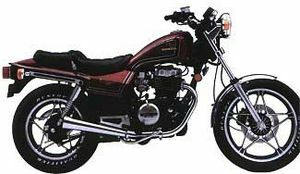 The Honda Nighthawk 450 designated CB450SC'82 was sold in 1982. Two colors were available: Candy Wineberry Red and Cosmo Black Metallic. The "HONDA" wing tank emblem was gold. The tank and side cover stripes were chrome. The speedometer had a 85 mph (135 kph) limit. The wheels were highlighted black comstars. The front fender was chrome. The serial number began JH2PC054*CM000015. 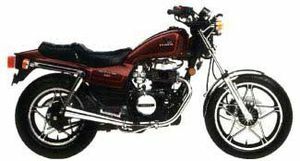 The CB450SC'83 was sold in 1983 in one of two colors: Candy Wineberry Red or Black. The pinstripes on the red bike were black, but on the black bike they were gray. The Honda wing tank emblem was gold. The front fender was chrome. The wheels were cast alloy. The speedometer had a 105 mph (170 km) limit. The serial number began JH2PC054*DM100001. The serial number began JH2PC054*EM100001. 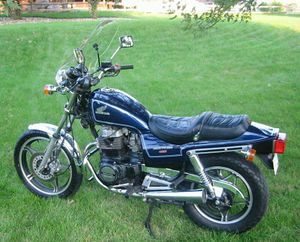 The CB450SC'85 was sold in 1985 in one of two colors: Candy Empire Blue or Candy Andromeda Red. The pinstripes on the blue bike were light blue, but on the red unit they were red. 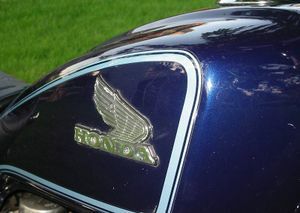 The Honda wing tank emblem was silver. The "Nighthawk 450" side cover decal was silver and red. The front fender was chrome. The wheels were cast alloy. The speedometer had a 105 mph (170 km) limit. 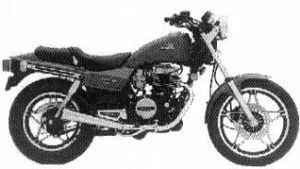 The engine was a 447cc 4-stroke SOHC 3-valve parallel twin. The transmission was a 6-speed. The serial number began JH2PC054*FM300001. 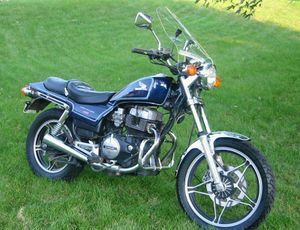 The CB450SC'86 was sold in 1986 in one of two colors: Candy Flair Blue or Candy Glory Red. The pinstripes on the blue bike were silver; but on the red bike they were black. The Honda wing tank emblem was silver. 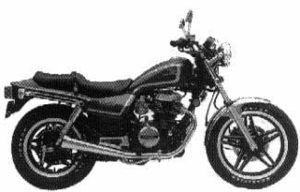 The "Nighthawk 450" side cover decal was silver. 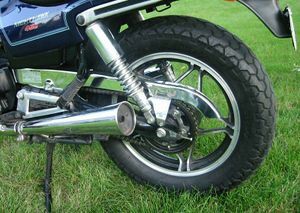 The front fender was painted the basic color (blue or red). The wheels were cast alloy. The speedometer had a 105 mph (170 km) limit. 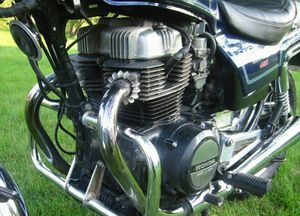 The engine was a 447cc 4-stroke SOHC 3-valve parallel twin. The transmission was a 6-speed. The serial number began JH2PC054*GM400001. This page was last edited on 28 November 2010, at 20:51.